Just as we are excited about transforming lives, our patients are equally excited to share their experiences with others. Read their stories below and feel free to call our office with any questions about making your first appointment! The team at Dr. Ashley Family Chiropractic looks forward to meeting you! I brought my super colicky 2 week old who also had gas problems to Dr. Ashley. I notice a small difference after just the first appointment, but after 3-5 appointments I had a completely different baby! She's much happier and has a much easier time passing gas. Dr. Ashley is so knowledgeable and explained how everything works together and when one thing is thrown off it really messes with us, especially babies. Her front desk staff is also fantastic! I got adjusted by Dr. Ashley one day and Nancy held and played with my daughter so I didn't have to worry about her. I highly recommend Dr. Ashley and her staff! I never have left a review for anyone before, but I must for Dr. Ashley. I have brought my daughter to Dr. Ashley since birth and I can't begin to explain the difference I have seen in my daughter. Major tummy issues and instantly after being adjusted I notice a drastic change. This testimony doesn't even do her justice! We had a successful V-BAC! Dr. Ashley helped me through every step of my pregnancy and I can't thank her enough. She looks at every aspect and is a great person to have on your health care team! My labor and delivery was everything I hoped it would be and I give a lot of credit to chiropractic care! I have been seeing Dr. Ashley for years and she has helped me beyond what words can say. Today it became even more evident we we brought our 9 year old in after having a mishap on the playground. The gentle approach. The constant gentle communication with a child who had not been to a chiropractor before. It really warmed my heart and confirmed we had made the right decision. I can say with 100% certainty that if you bring your child to Dr. Ashley, they will leave in better condition, better spirits and just plain better. I starting taking my son to Dr. Ashley because of his ongoing problem with bed-wetting. It had become a nightly occurrence, sometimes more than once a night. As a result, it was followed by constant changing of bed sheets, pajamas, and the frustration associated with it. It didn't matter how much or how little he was given to drink before going to bed, he would wet the bed nevertheless. I couldnt believe the results we experienced after seeing Dr. Ashley! 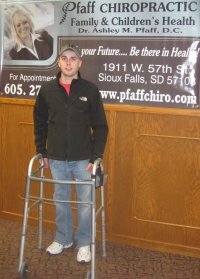 I would recommend Dr. Ashley Family Chiropractic because it sure helped us! Thanks! I loved that Dr. Ashley specialized in pregnant women and infants. They were very accomodating and extremely friendly! I really enjoy being pain free. Dr. Ashley is excellent at what she does! We brought our newborn in because she was experiencing a lot of reflux issues and couldn't lay flat to sleep. (which made it difficult for mom and dad!) After her first visit at Dr. Ashley's, she slept so well that night! She is more content with every visit. She is finally comfortable, and so are we! Thanks Dr. Ashley Family Chiropractic! Having chiropractic care throughout my pregnancy made the experience of being pregnant more enjoyable. It reduced my labor time and made me more comfortable! I will continue to see Dr. Ashley! Thanks! I am so thankful that my children have an amazing Chiropractor! I didnt realize how much they needed it! Thank you for giving my children relief. You're the best! Our family loves Dr. Ashley. She's always been there through the aches and pains! Thanks to the dietary advice, nutritional supplements, and adjustments I received from Dr. Ashley, I feel like I can accomplish what I need to get through any day feeling alert and full of energy! I was so impressed by her commitment to healthy living! After major surgeries that left me wheelchair bound, I was discharged from the hospital on September 26th and was told to continue with physical therapy to try and make a full recovery. I continued with therapy four days a week and three days a week with Dr. Ashley. Every day I went in to her, she would always be so concerned about how my day was going and how I was feeling. I didn't know what to expect from her and to what extent she would be helpful. She told me, "I can't promise you a miracle, but what I will promise you is one thing: chiropractic treatment will allow your body to function at its very best without nerve interference. With that being said, your recovery will go smoother, allowing your body to respond to therapy and heal at optimal potential". Dr. Ashley did all of that and more, the care she provides is not only from her practice of Chiropractic, but from all aspects of the care that I need. I can't put in words to how good of a bed side manner she has. Anytime I have a conflict with anything dealing with my health, I know she will have the best answer and if she can't, she will do the best to find the answer to what my concern was. Dr. Ashley has a very convenient and quality location. All of the equipment that Dr. Ashley offers is top of the line and it would be very hard to find anything equal or better to what she provides. She works very well with my schedule and if I need an emergency appointment, she will be sure to get me in as soon as she can. Her sense of humor and her comfortable professional manner is not like any I have ever dealt with. I strongly advise anyone who needs the help from a chiropractor, to at least have a consultation with Dr. Ashley and you will not be dissapointed. I will continue to go to Dr. Ashley.